In New World you begin on the shores of an unfamiliar land with little to your name – just rags for clothing and a sword to brandish. It might be all charming, flowery meadows on the horizon now, but beyond the rolling coastal hills of Shingle Harbour lies the rest of Terra Vitae Aeternum, a vast and haunted landscape. Thankfully, Amazon Games’ MMORPG doesn’t leave you to the elements on your lonesome – this sandbox has community and companionship at its core. The heart of the game lies in joining forces with other players to build fortresses, establish companies, and explore the mysteries of New World together. Its namesake is the age of exploration that took place between the 15th and 18th centuries. But unlike America and Australia, the land of Aeternum has hidden arcane forces beneath its surface, which you and a company of friends can uncover. As the old saying goes, it takes a village to battle the undead forces of evil. Defenseless like a newborn babe, thrust into a dangerous world, you start by gathering resources and crafting basic supplies. As you progress through the crafting tree you can forge your character around your weapon and armour choices. “It’s completely classless progression,” Studio head Patrick Gilmore tells me. “You’re not locked into a single kind of role definition.” Building classic characters like a healer or tank is still possible, but you can also switch up your playstyle dramatically at any time using different items. 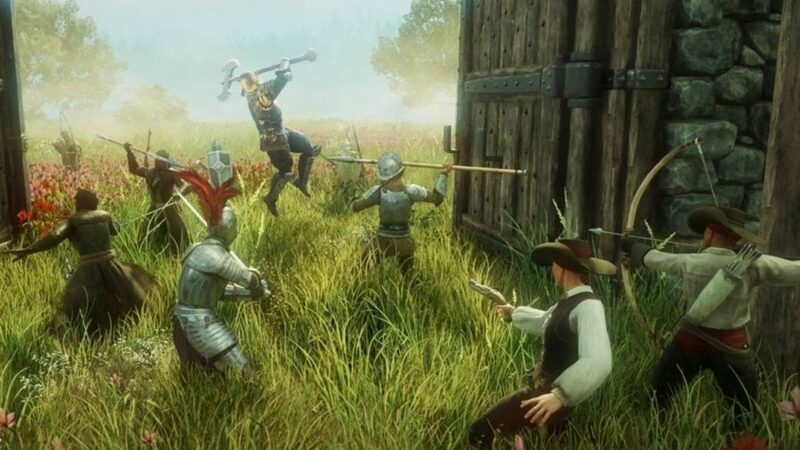 Outside of weapons and equipment, New World has an attributes and trade skill system that lets you develop your character beyond fighting capabilities. “It’s not just combat that wins the war.” Gilmore notes. Building a working fortress will take all kinds of players – blacksmiths, engineers, carpenters, and alchemists. But you don’t want to spend the whole of your RPG life inside your fortress’ walls. Sometimes, it makes sense to put down the metalworking hammer and take up one made for battle. If your company wants to become bigger, you can declare war on other fortresses and battle them for land in PvP combat. Enemy fortresses are difficult to breach, meaning that your team will have to strategise if you want any chance of winning. Just glancing at the map inspires exploration. Your mobile campfire serves as a respawn point, Fallout 76 C.A.M.P. style, making pioneering easy and difficult battles easier to retry. One place that caught my eye was to the north of the map, named Shattered Mountain and highlighted in splodges of red ink. So naturally, I set off north to see what all this ominous cartography was about. As I approached the marker I had placed on my map, the wind started to pick up and turned into a snowy blizzard. Even through the squall, I saw several spectres with glowing red eyes guarding the entrance to a giant stone fortress. This is where New World delves into supernatural and arcane vestiges. You’d be wrong in thinking Aeternum was unclaimed before you arrived on its sandy shores. “It’s a continent where clearly something existed long ago,” Gilmore tells me. “You may encounter diaries, a commission, or a journal. It might be a letter from the old world telling you a little bit about what people have done to survive.” But to get to those secrets you’ll need numbers. You’ll come across difficult monsters and your chances are better together. After my shameful defeat in the north, I decided to march down south. I mapped a route through Brightwood and Windsward and set off. 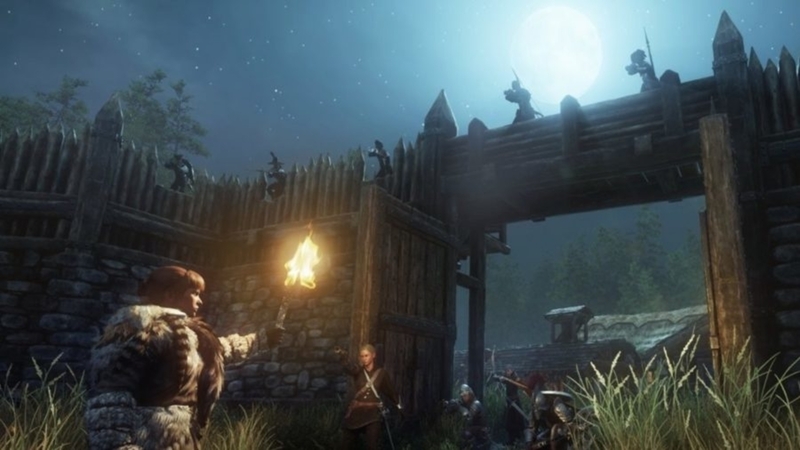 New World is currently in alpha, but its beauty could already rival The Witcher 3. 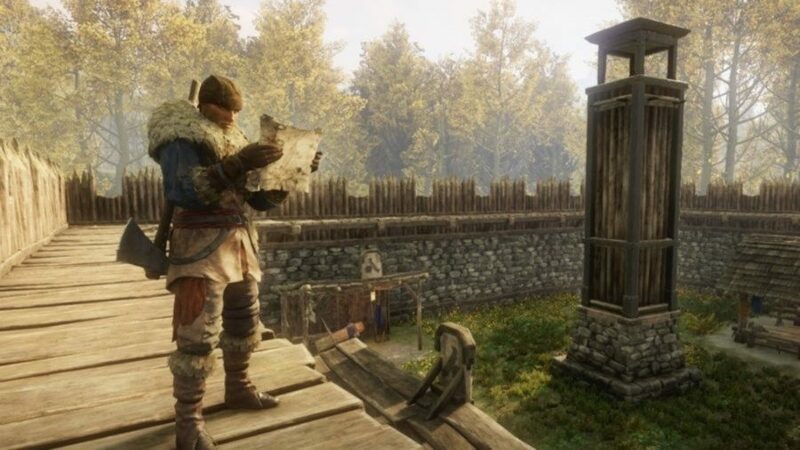 Amazon Games Studio have laid down strong foundations for the New World, and seeing the empty places that were soon to be filled with players was an oddly peaceful experience. On my journey, I passed through the swamps of Weaver’s Fen, crossing a stone bridge with deep carvings in its surface and walking into darkness and mist. Undead creatures lurked near the edges, but I cleaved a path with my axe. As I made my way through the centre of the map, I found a small village, and wondered what Amazon Games had in store for it. Was it going to stay desolate and abandoned? Could it be haunted, or inhabited by something more sinister from the arcane realms?